Lufthansa, Germany’s biggest airline and one of the world’s largest airlines, canceled about 3,800 flights scheduled for Wednesday, Thursday and Friday because of a planned three-day strike by the pilots’ union. More than 425,000 passengers are likely to be affected by cancelations, mainly on flights of airports in Frankfurt and Munich. For this reason, Lufthansa’s hubs in Germany were almost empty on Wednesday. The cancelations include domestic and intercontinental connections. The strike also affects Lufthansa Cargo arm and the company’s low-cost carrier Germanwings. Only 500 short and long-haul flights are continuing as scheduled. The strike is expected to be one of the biggest walkouts in Lufthansa’s history. It was announced by the pilots’ union last week. The Vereinigung Cockpit union represents 5,400 Lufthansa pilots. One of the pilots’ main demands is the right to choose when to retire. Additionally, the pilots are asking for a salary increase of 10 percent. Talks between management and workers failed and each side of the conflict blames the other for the breakdown of the negotiations. 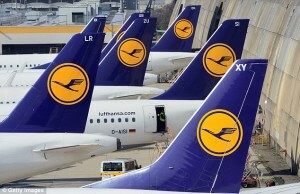 Lufthansa is urging the pilots’ union to renew negotiations as soon as possible. Although both the union and Lufthansa declare they are ready to talk, the pilots want to see a new offer first and Lufthansa management says that no new talks would take place while the strike is ongoing. The three-day pilots’ strike is estimated to cost Lufthansa German Airlines about 50 million euros ($69 million) in lost profit. The strike was announced in advance by the pilots’ union Vereinigung Cockpit, giving Lufthansa time to make some arrangements. The company says it has sent out more than 200,000 text messages and e-mails to inform its customers about the upcoming strike and also to offer them alternative travel arrangements, some were rebooked on trains or different airlines. However there were a lot of travelers still caught unaware of the canceled flights. As a result of the strike, there are about 30 canceled flights to and from Sofia Airport. Sofia InterPlex Destination Services is receiving more and more inquiries by people traveling to Sofia or airports in the neighboring countries to make their flight connections. We keep providing our customers with high quality services at competitive prices.